Agricultural Engineer Career Episode Sample 2 Project Name: Adaptation of Dehusking Machines In the second Career Episode, the author elaborates the project “Adaptation of Dehusking Machines” which she carried out as an Agricultural Engineer of Agricultural Machinery Centre. During this project, her major responsibilities were: To design the dehusking machine with the help of AutoCAD and to obtain information regarding buckwheat and buckwheat husk in detail. To design the dehusking machine’s grading and sieving unit with the help of AutoCAD. To perform the fabrication of separator using various mechanical tools and machines. To prepare samples and carry out the procedure of dehusking for testing the machine. To check the machine’s performance for finding maximum rpm for dehusking buckwheat. To assess the dehusked buckwheat and prepare a report on it. To implement the designed dehusking machine in the field. 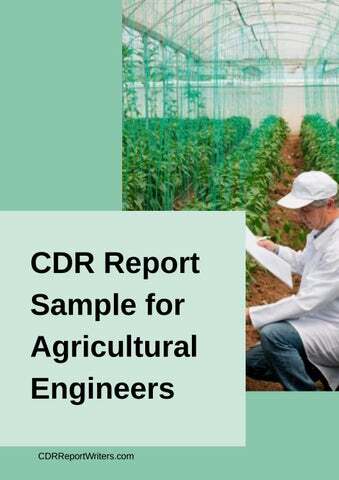 Agricultural Engineer Career Episode Sample 3 To provide training to main farmers, private manufacturers and stakeholders on different technologies utilized in the machinery of farm, their purposes, benefits and applications. To investigate and control the quality of any farm machinery imported to the country. To prepare and assess the standards of various machinery of farm. To prepare essential documents and reports in different stages of the project.